Tucson Arizon's Casa Luna Bed and Breakfast. Come relax at Casa Luna B&B with mountain views, private entrance suites, swimming pool, hot tub, gardens, & a bountiful breakfast; 5-7 day discounts. We offer a beautiful setting for hosting events up to 50 guests including garden and pool area, main house great room, guesthouse great room, four powder rooms and kitchen for caterer. Experience the casual elegance of this intimate bed and breakfast on 2.2 acres in the foothills of Tucson's Catalina Mountains with stunning views of the mountains, sunrises and sunsets. Visit Tucson's many attractions from its central location just minutes from the University of Arizona. Enjoy luxurious suites with private entrances, patios and baths. Celebrate weddings, birthdays, romantic interludes and other special occasions in the spectacular guesthouse and gardens. Selected as: The Most Affordable Luxury - Arrington's Inn Traveler 2004 Book of Lists. 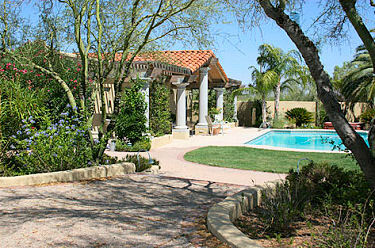 This and other Tucson Bed and Breakfast Inns can be found here online in The Register.